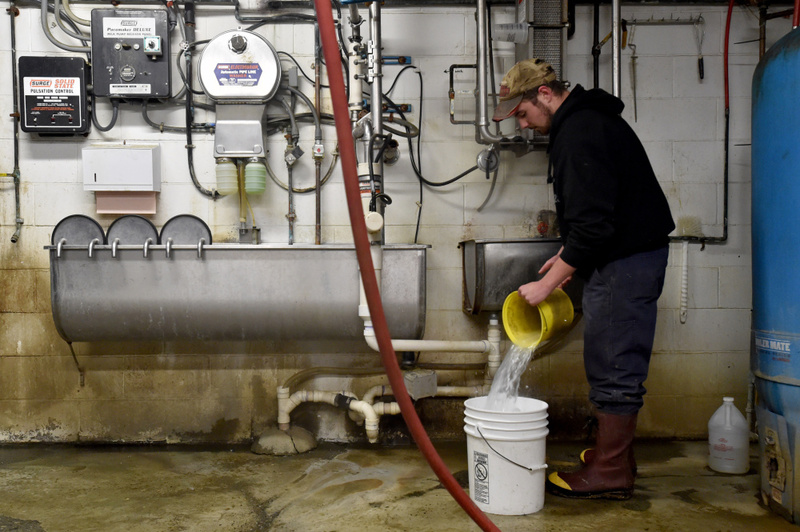 High tech help can save labor costs while keeping cows calm, but Maine farms have been slow to take on one kind of technology that has expanded internationally — automatic milking. A small calf steps up to an opening on one wall of the barn at Aghaloma Farms in Knox, sticking its head through the metal-lined opening that’s shaped like an oval pulled outward in the middle, and clamps onto a small tube. 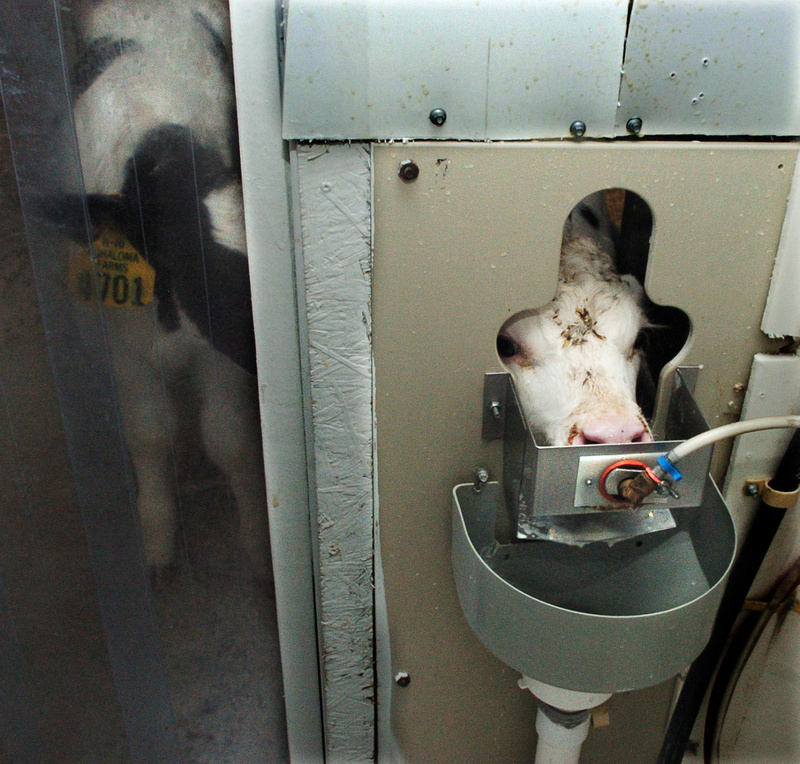 In the small room next to the calf area, a machine is funneling milk replacer through the tube to the calf. Once it’s had 5 quarts of the liquid, the machine will stop sending the food its way. 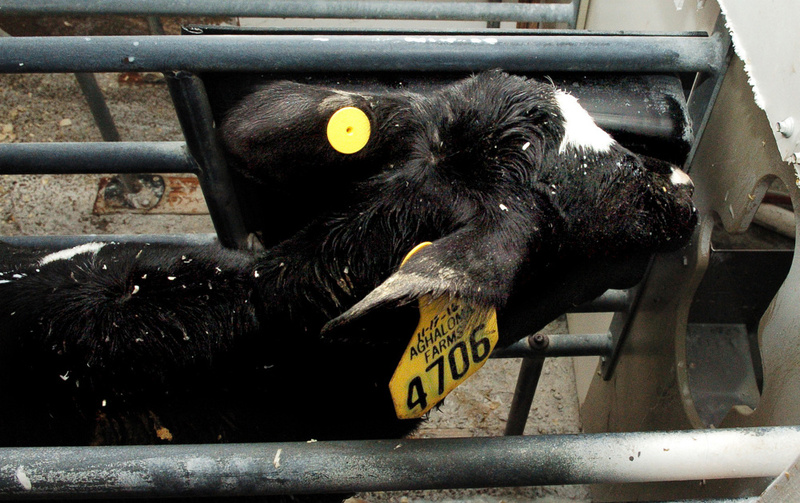 When the calf enters the area to reach the computerized milking system, flanked by two guardrails, a black sensor box on its left reads a yellow chip in the calf’s left ear. The program keeps track of each calf separately, monitoring how much they drink. None are given more than 5 quarts and if they drink less, the farmers know to check up on them. Aghaloma Farms is one of a few dozen farms in Maine that have folded automated farm technology into their routines. One of the newest to embrace the technology is Misty Meadows Farm in Clinton. 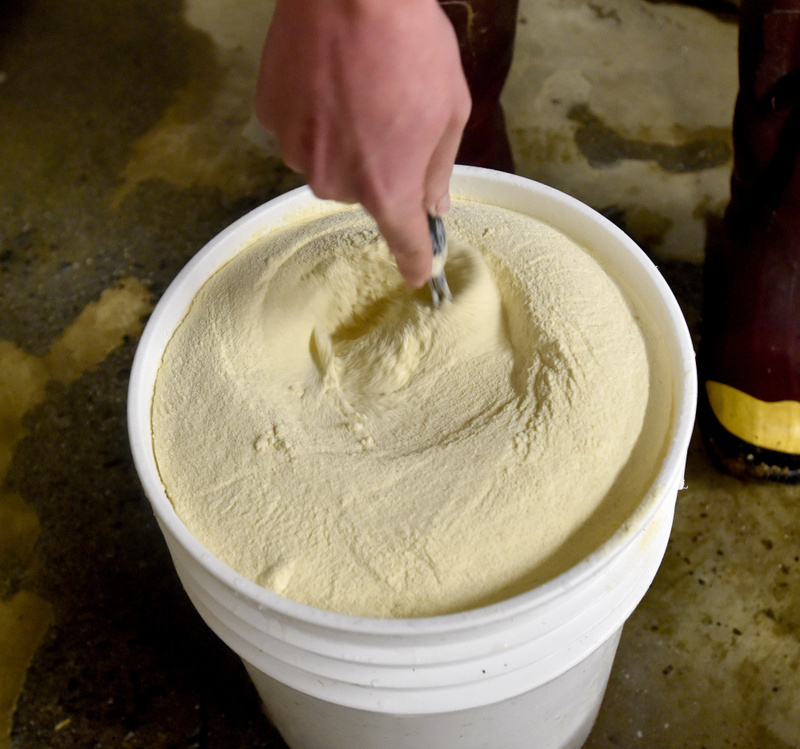 The farm, which has hosted Maine Farm Days for years, is busy installing the calf-feeding technology this December with the hopes the new system will be up and running by January. 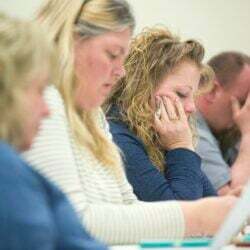 Kimberly Wright, a co-owner of the farm, said the project has been “a year in the making,” partly due to research and partly due to construction. “It took a lot of time for us to decide what exactly we wanted to do,” Wright said. Wright and her husband traveled to other states to look at farms and examine the layouts they had for their machines. 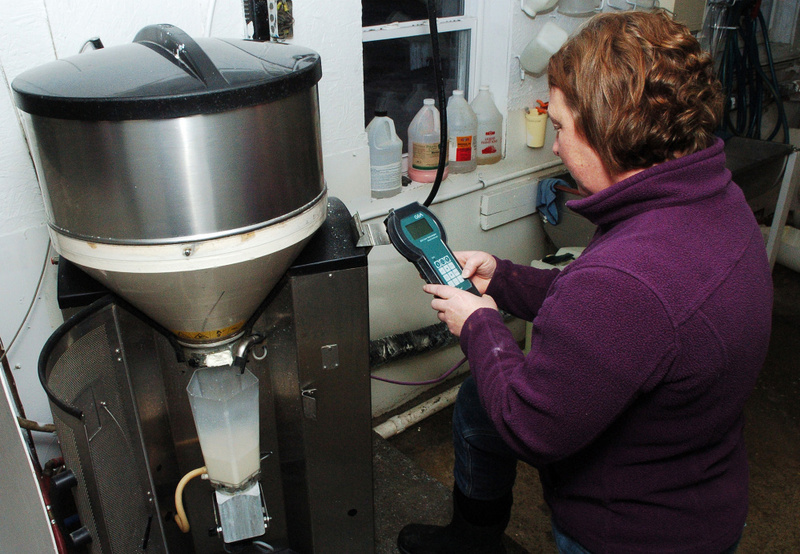 While Maine farmers may be embracing automatic feeders, they are slow to take on one kind of technology that has expanded internationally — automatic milking. While on his sabbatical in Europe more than a year ago, Richard Kersbergen, a professor for the University of Maine Cooperative Extension, said he found that about half of the Netherlands’ farms use “robots” to milk their cows. Farms in Vermont and New Hampshire are using that technology to save time and improve cow behavior, he said, but as of now no farmers in Maine have a machine for automated milking. At Misty Meadows, the calves are kept in hutches, or small plastic or wooden structures that can hold one calf, sometimes more. But soon they’ll be moved to a single structure the farmers built to incorporate the automatic calf feeders. 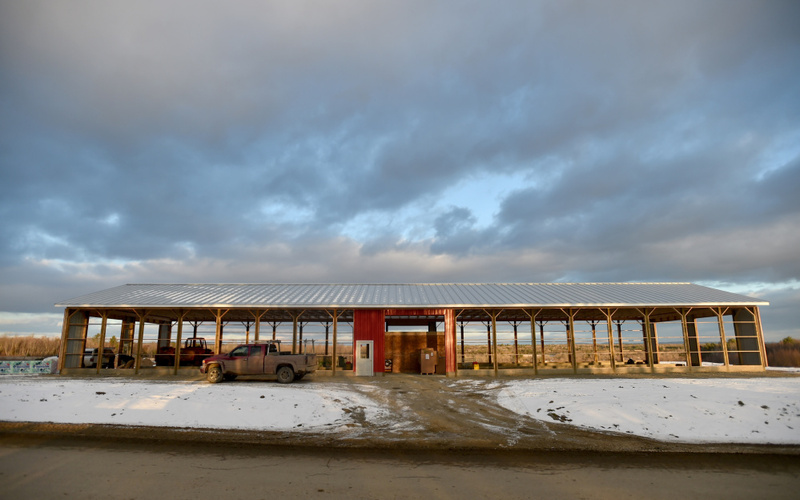 While it was a long process, both deciding on a design and constructing a new barn, Wright said they are hopeful the automation will make the farm more efficient. 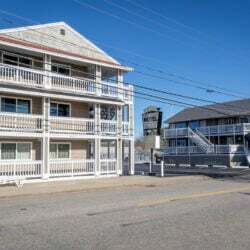 In order to justify a technician living in Maine, enough farms would have to employ the technology first, Kersbergen said, which has its own barriers. All told, it can cost $250,000 after the farm builds a new structure to facilitate the milking robot. But Kersbergen said the technology shows significant benefits, too. 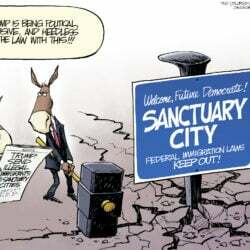 “You also reduce your labor costs considerably,” he said. Most systems also store data on each animal, which can be extremely useful for farmers. The cows seem to like the robots better, too, Kersbergen said. The cows also have more free will with automated systems — they go to the robot when they want to be milked, not the other way around. “You’ll find that it’s just incredibly quiet and calm in there,” Kersbergen said, referring to farms that use robots for milking. 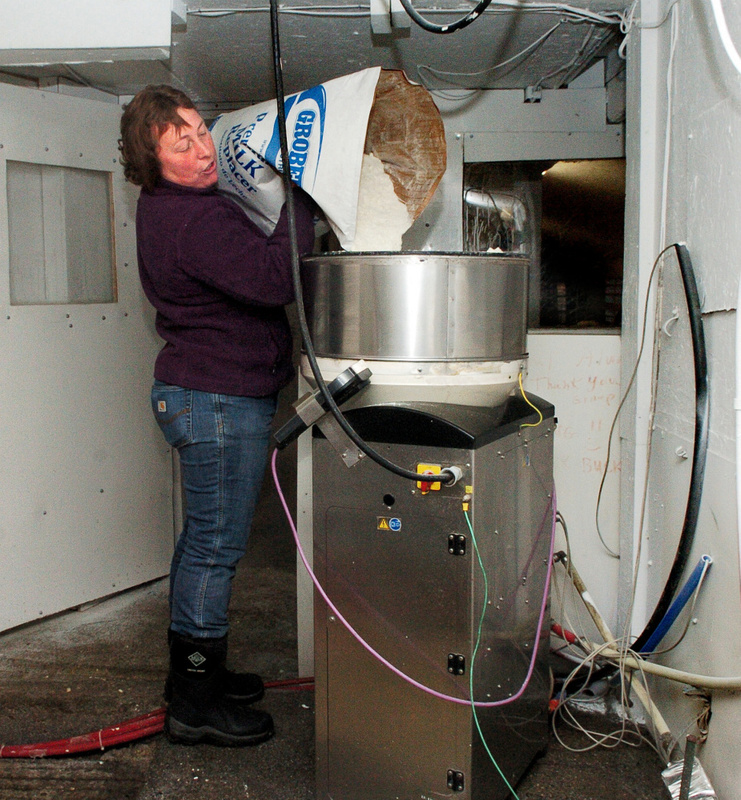 Cammie Curtis, a co-owner of Aghaloma Farms, said the same is true for the “robots” Maine dairy farms are using, which are the automatic calf feeders. The farm’s machine keeps the calves calmer than the old routine of twice daily feedings at specific times did, Curtis said. Now, the calves can head over to the tube in the wall and feed themselves at 2 a.m. if they choose. “It saves so much, so much time,” Curtis said, adding that the person in charge of the calves can now focus on observing them and making sure they’re healthy. The farm has had this technology for more than five years now, said Cheryl Carson, co-owner of the family farm. The automatic calf feeder cost $21,000 for the machine, set-up and the ID buttons, and saves five labor hours each day, she said in an email. Kersbergen said he estimates there are at least 20 farms in the state with this technology so far. Wright from Misty Meadows Farm is also hopeful that their new system will keep the calves healthier, she said. This way of feeding will be more natural for them, so they may grow better, which may lead to more productive cows in the future, according to research, she said. As to whether the farm will look into more ways to automate the work, Wright said time will tell.